h3y... can you leave me a note? For this challenge we were given a binary and the libc used on the server. Up front I should say, I didn't solve this challenge the way it was intended. Other writeups out there will go over the proper way. This writeup goes over my way. Password must be set to 32 digits or less. Let's look at the options in turn. We're given the ability to select an index to leave a message on, a length, and a message. Often times if you can select an index, it might open up opportunities for arbitrary writes. Trying different numbers here is usually a good strategy. I like to try 0 (which is usually a good working case), some large number (can i write to a place far away? ), some negative number (can i write to a place likely i shouldn't?). Ok, so clearly it's not doing bounds checks there. What about negative small? So something is strange already. It's treating -1 as an unsigned int (thus too large), but it's OK attempting to dereference my 65535? Let's look at size. Looks like there's some difference when using a large length. Let's dig into the code a bit here. 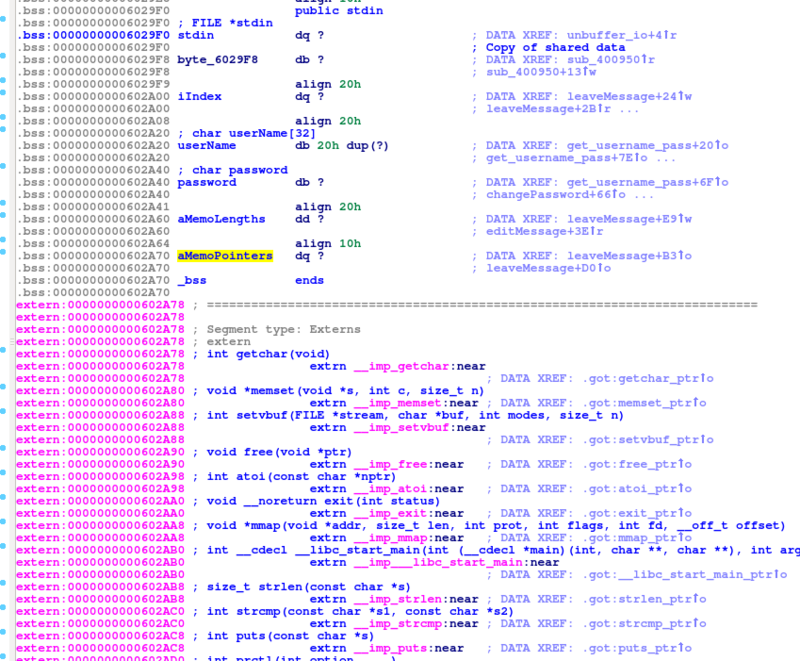 Note, I'm using IDA in this case as radare2 has issues parsing the jump table correctly. We can see why the large index was causing a segfault. In the very first block, this binary prompts for an integer, then uses that in an offset to a static global location. It's interesting to note that the global Index is set prior to any sanity checking. Further, the compare in the second block is a "ja" or "jump above", which is an unsigned comparison operator. First, the length is compared against 32 (0x20), and the branch is chosen based on that. Note for a second step 6. Consider why this would be unusual. The answer is that you're storing a stack address to a global variable. Remember, the stack is meant to be temporary for that procedure and only contain local variables. There's really no good reason to store a pointer to the local variable in a global variable. Once you exit the function the reference will be moot and the context will be lost. From an exploiter perspective, this looks like a target to leak the stack address. Couple strange things here. First off, you just told the program that you would give it more than 32 bytes of data, and it only allocated 32 bytes. So there's an obvious heap overflow here. Further, it doesn't bother storing the address of your buffer anywhere globally or returning it. This is actually a memory leak in the conventional sense that you have no pointers in your code to this area in memory after the function returns. What can we say about this function now? Well, it give us the primitive to set a global variable iIndex. It loads an address before bounds checking. On small sizes of length, it provides us the ability to leak the stack address by storing it at a global address. Finally, it provides us a primitive for an arbitrarily large sized malloc (generally a bad idea), and a heap overwrite. That's probably enough for one function. Let's move on. Option 2. Let's give it a run. A few things to notice. First, it doesn't prompt you what item to edit. Second, notice those strange unprintable characters at the end. These are often times indicators that the program is over-reading memory. This is because the way strings are stored in C code is a null terminated character array. Note the null terminated portion. If the array is not null-terminated, then when you print a string (such as printf("%s",mystring)), your program will happily keep printing along until it find a null. The problems are notoriously difficult to find with fuzzing since the program often times will not crash. Let's see what's going on under the hood. Take a close look at that print statement. Turns out it's missing a step. It's not dereferencing the pointer before printing. What it's actually doing is printing the array of pointers as a string. Pointers don't generally print well as strings, thus it looks weird. We can verify this by breaking at that print statement and seeing what's there. Note the rsi variable. It's pointing to a pointer that points to text. Thus, what we're actually seeing is the printf function frantically trying to make sense of printing a "string" that definitely isn't a string. What this means from an attacker perspective is, we have a trivial memory leak of heap space. Since the heap itself isn't randomized, we now have completely derandomized the heap. Ok, that seems good. As before, let's try a large number and a negative number. So that's interesting. Before when we entered a negative number it complained. This time it segfaults. This means it might not be validating negative numbers correctly. Let's peek at the code now. By now, you all can probably see what's going on at the beginning. It's prompting for an integer and using that as an index into memo pointers array. There's a little trickery when you're reading this assembly. I missed it the first few times reading and wondering why the negative number was causing a segfault. The key is in the first block. Can you find it? The key is actually what isn't in this function. After prompting for an integer, this time the code does not perform the cdqe. This one instruction changes the exploitability for this function. cdqe performs a conversion from double to quad word sign extended. Thus, the integer was read in to a double word size. When converting it to a quad word (64-bits or a "long long"), there's a question of if to assume the source integer is signed or not. Thus, skipping cdqe causes a negative integer to just be treated as a rather large positive 32-bit integer. This is why the negative number crashes the same way as the large positive number. It actually is a large positive integer in this case. One implication of this is that we can really only use view indexes forward, not backwards (bummer). The second step locks us in to only being able to view integers 0-4. Finally, the last block does as you would expect and dereferences your memo pointer and prints it. Can you see what's wrong? 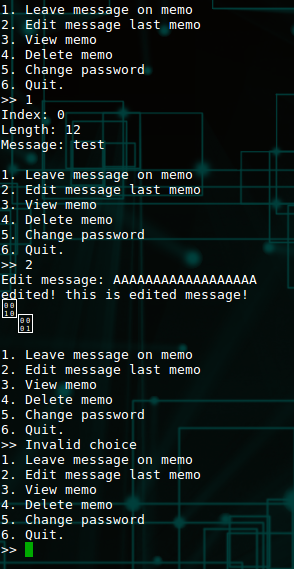 If you've been following along you should know that this binary is basically telling the user that they have 5 slots available to use to store memos. Pointers to those slots go into the aMemoPointers global. However, aMemoPointers doesn't appears to have enough space. It looks to be able to handle a single pointer, as if the source code was written something like "char *aMemoPointers;". The memory runs into the externs section so it doesn't really cause problems. But... strange. We're getting a segfault when we delete a large index, but no error aside from "no message" when we delete negative. With those in mind, let's look at the code. The beginning is the same as others. Note that it does cdqe, so we can put in negative numbers and have it subtract instead of add large numbers. It dereferences whatever is at that index and checks if it's already zero. Note, there's no bounds checking here, so this is why you get a segfault on a large number (it runs off the page). If the entry is non-zero (not really checking for a valid pointer, it will free the pointer that's in that array and zero out the array slot. Not much else going on here. Before we change password, let's take a peek at what happens when we set the password. Pretty strait forward, just filling in global variables. As shown before, the username and password fields are right next to each other in the global address space and appear to each legitimately have 32 bytes of space. Interestingly, it does not accept the password that i just gave it as my new password. Sounds like something is a bit off here. Looking at the first block, it reads in 32 bytes of input into a buffer, then string compares it against what's in the global variable. This seems normal enough. The second block checks the length of the existing username and password fields, then adds one and zeros that much space out. Strange and excessive calls in my opinion, but ok. So basically, not only is it going to stop reading at the newline, it will also stop reading at 0xff. Perhaps this affected the solution you were supposed to use, but I didn't notice it affect my solution. Note, however, that this read function does not null terminate. This is why the new password didn't work right. Given the way it is being read, this is overcome by simply using a null terminator in your new password. I.e. : instead of setting the password to "pass", set it to "pass\x00". Putting it together, we can realize that an arbitrary memory write exists. The edit function allows you to edit the last written memo. It utilizes the global index value to track what the last written index was, and allows you to use negative indexes. What this means is, we can edit a message that never existed, and we can control the location that is being written to, thus an arbitrary write. We get the "Index too large" error, but there's a check before that. The very first block has a check to see if the index is in use before checking if the index is too large. This means if we can select a negative index and ensure that it is non-zero, we can set our index to it. 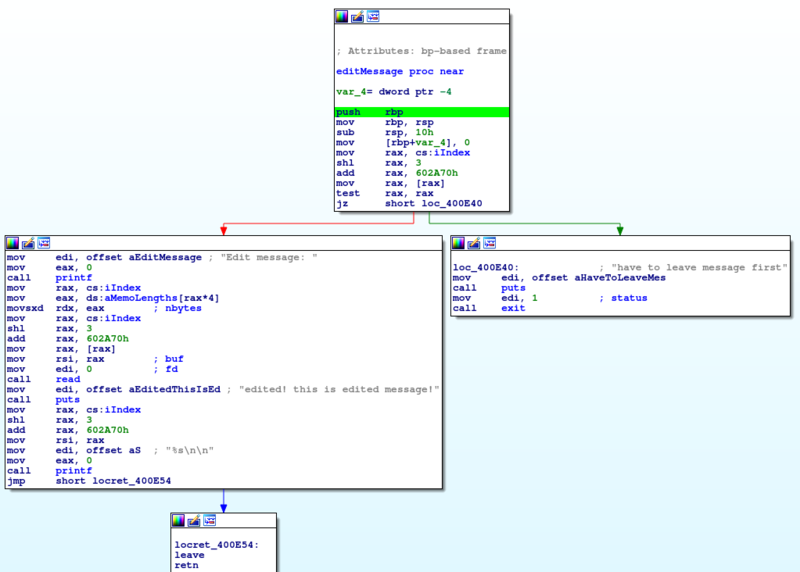 Using a debugger, we can take a peek at where this is. Note rax. We can see that when i use the index -8 (chosen mostly arbitrarily), the leave message function looks for the index 16 bytes into the username. Since I didn't want to bother moving offsets around, i just stuck with this index for the rest. However, if you wanted to move it you certainly could. In fact, -10 might be a better choice as it puts the index right at the beginning of your username global. Now that we can set the global index variable, we can use that to control a write using the edit function. However, one things that happen in the edit function is it checks the memo length array for how much to read. We can calculate where this value will end up fairly easily. 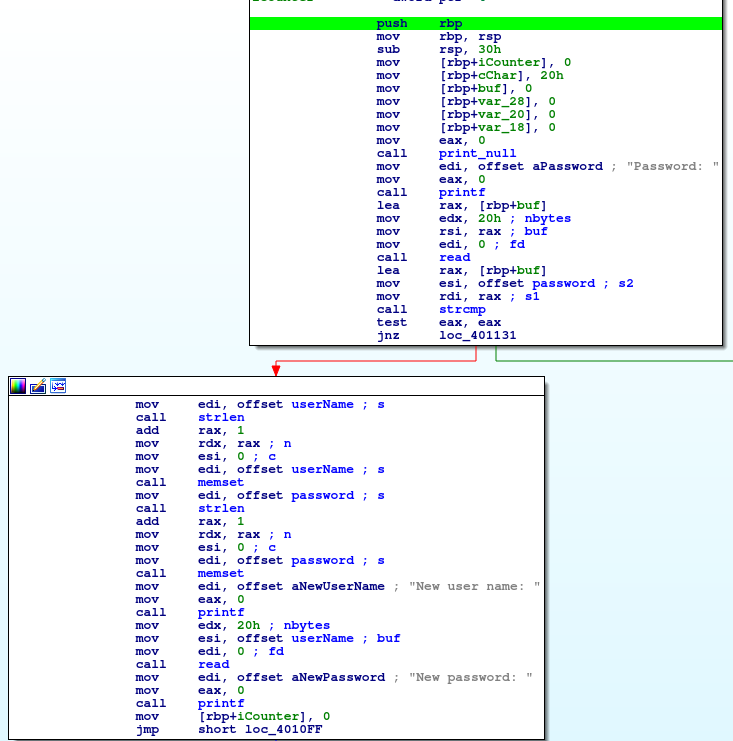 Note that I have written helper functions (such as change_password) that just wrap those binary calls. I'm not going to go into those as they are fairly strait forward. To use this, we need to be able to remove some randomization of the binary first. That means, in this case, a memory leak. Having an arbitrary read allows you to not have to guess on your exploits. With a minimal arbitrary read you should be able to fully remove randomization from almost any binary. I spent a while looking for memory leaks and I found a few. This was already mentioned in the edit memo section. It's blatant, and it allows you to know exactly where the heap is. There's one little problem still though. While we have an arbitrary read and should theoretically be able to determine the stack location using that, pwntools wasn't working correctly at the time... Luckily for me, there's a strange behavior that I mentioned in the leave message section where it actually writes a stack pointer address to a global variable. This behavior in general is odd. Stack variables are local. If the goal was to keep track of a local pointer, well you already have it. Placing that pointer into global space just gives attackers the ability to de-randomize the stack address. We now have a pretty good idea of where everything is on a fully randomized binary. Time to exploit. It turns out that, in my example, this was the stack address + 88. If you used different values you can directly calculate your own offset. After overwriting that, simply exiting from the program will trigger our code execution. So finally, we have an arbitrary read, write, and ability to jump execution to wherever we want. The choice of what to do at this point is pretty open. We were given the libc that they are using. This is always handy and means that if we can leak a resolved address, we will immediately know the address of any function in libc. Remember that this binary is FULL RELRO. What that means is that lazy linking of the functions is disabled, and all the addresses are linked up front. Further, the Global Offset Table (which stores these pointers) is made read-only. This is why we aren't just overwriting a GOT entry. However, we can absolutely still read the GOT entry to leak the address of libc. From there, we use the known libc binary to calculate the offset to what function we want. We have now fully derandomized libc as well. I chose to use "system()" as my function call of choice to execute. However, given the prctl stuff up front, I was not able to call /bin/sh directly. Not a huge deal, because I can still call "ls", "cat" and others. To do this, I need to use a pointer to the command I want to run. Given we have a large globally read/write area available, and an arbitrary write, this is strait forward.